Our school Mission Statement set outs the fundamental principles which underpins everything that we do at St. Joseph's. Christ is at the centre of our school. We follow the ways of Jesus and this ensures that we treat everyone with respect. 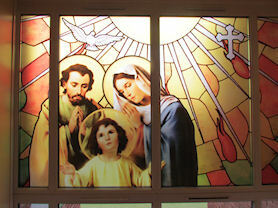 In the entrance area, we have our mission statement displayed, along with a statue of St Joseph. This makes sure that everyone who comes into our school knows that our faith is very important to us here at St. Joseph's. We have daily acts of collective worship, assemblies, hymn practices and prayer services. Prayer is a central part of our school day. Apart from praying in our classrooms four times a day, we also share circle time and prayer services. 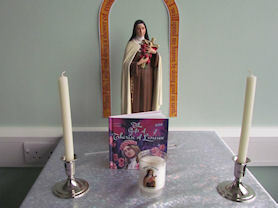 We sometimes have lunchtime prayer groups which pupils can attend (Rosary group, Advent, Lent) and every classroom has a dedicated prayer area which includes words from Scripture, Liturgical images, artefacts and prayers. Each class has a Patron Saint, and the children learn all about their Saint, with a display in each classroom. 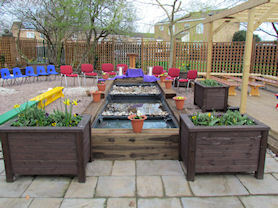 Classes also spend time in our beautiful prayer garden which is used for quiet reflection. 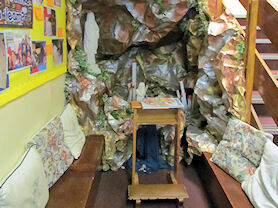 We have a replica of the Lourdes grotto under the stairs, which children use for quiet prayer. Central to our school week is the celebration of Mass with the whole school every Wednesday morning. 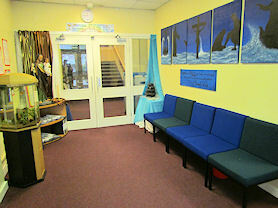 This takes place in our school hall and is attended by families and members of the parish. We also have regular school Masses at St. Joseph's church with the parishioners on a Sunday morning. Father Stephen, father Gerry, Sister Pius and Sister Catherine are regular visitors to school and enjoy spending time with the children. We are honoured at St. Joseph's to be one of only a few schools that have the permission of the Archbishop to keep the Blessed Sacrament on site. 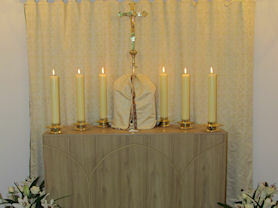 We have a beautiful chapel in our school hall in which the tabernacle is kept. One of the children said: “I like having the chapel because when I pray, I look at the tabernacle to remind me that Jesus is always with me”. Our faith is evident in all areas of the school. Prayer Corner, complete with a replica of the grotto at Lourdes. One of our prayer tables. The School Chapel, where the blessed sacrament is kept. Our beautiful stained glass above the stairs. You can see some photographs from some of our faith-focussed events on our Special Events page.